WINE TASTERS @ EWHURST: Last minute gentle reminder that if like many of us within the parish, you enjoy a delectable glass of wine now & again, - or perhaps would like to know more about wine i.e. ~ choosing the correct wine for a particular dish ~ selecting the best region for your favourite tipple ~ learning the different flavours; -tastes; - aroma’s or simply want to become more of an expert in this favourable ‘past-time’ ~ then why not consider joining in the monthly Wine Tasting at Ewhurst. This is a super little social group of like-minded people who enjoy spending a couple of hours per month, - tasting and commenting on a selection of superb wines - plus tasty bread and a few nibbles - all wrapped up in good company, in a cosy venue - that being the Herdman Pavilion, in Ewhurst Green, (TN32 5TB) The date for the August Wine Evening is Friday August 31st.- THAT’s TONIGHT from 7.30pm - 9.30pm. No membership is required, - just a courtesy call to Jan (sec) to ensure there will be sufficient wine & nibbles for all to enjoy. -- It wouldn’t do to run short now would it ? A charge of £5:00 per person is required upon arrival. If you think that this is something that would be of interest to you, then do please contact Janis via her email: janhooper3@hotmail.co.uk to learn more about this very friendly and welcoming group. We are a very friendly and social group and will certainly ensure you have a warm welcome upon arrival and a glass of superb wine in your hand, very shortly after.! EWHURST, STAPLECROSS. & BODIAM GARDEN SOCIETY: Last Reminder that our local Horticultural Society, are holding the last of their shows for 2018. The “Flower, Fruit & Vegetable Show” will take place on Saturday September 1st. - THAT’s TOMORROW --- STAGING YOUR ENTRIES ARE BETWEEN 9 AM AND 11.AM. This will be held again at the Village Hall, Northiam Road, Staplecross TN32 5QG. The doors and sights, and scents will be open to one & all to come along and view from 2.30pm.This is a delightful show with something for everyone and a class or 2 to consider entering. With over 50 Classes to choose from, you’ll be spoilt for choice as it’s not just for the “green-fingered” folk amongst us !. Schedules are already at the Londis Store in Staplecross village, - and if they have run out, please contact the two Show Secretaries which are Pam on 01580~881839 or Maggie on 01580~839941 for more information Friendly help & guidance is always unstintingly given, so why not give it a go ? It’s fun, rewarding and whether you are awarded a class place or not, - it hopefully will inspire you to continue to take part in a popular community event. Why not consider becoming a member ? -- just chat to any member at the show or contact Gill (Chair) on 01580~830551 or Peter (Sec) on 01580~830316 for more details of what to look forward to for the rest of this year and what will be in store in our 2019 ‘Calendar of Events’. STAPLECROSS BOWLS CLUB: Beginning the month of September and back to their busy schedule, the members have four (4) fixtures to play this week - Three are ‘At Home’ matches with just one ‘Away game to play. Match No:1 is to be played on Saturday September 1st and is to be played on the club’s own home ground at Northiam Road, Staplecross. Their opposition here will be a team from “The Observer” and this match will commence at 2.30pm. The following day, Sunday September 2nd will be the second match and is the only ‘away’ game this will see the teams travel to the neighbouring village of Iden. This fixture will be part of the ‘Mermaid Trophy’ and will begin at 2.30pm. On Wednesday September 5th Our club will play host to a team from Hertsmonceux on their home ground beginning at 2.30pm and the final fixture for this week will be on Thursday September 6th against a team from Hastings at our clubhouse again beginning at 2.30pm. For all further details of these matches and of other social activities which the Staplecross Bowls Club are organising, please contact them either via email: simmonssm@talktalk.net or by telephoning Brian on 01580~830570. New members will always be very warmly welcomed. ROTHER RAMBLERS: Those stalwart members of this popular walking group have organised three (3) more walks all within our close neighbouring areas. Walk No:1 is arranged for Sunday September 2nd and will be an 8 mile circular through woods and fields. 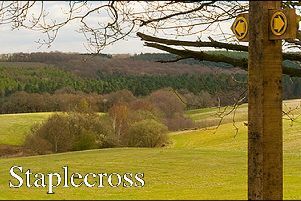 The meeting point is at Wood’s Corner, Dallington near Heathfield. OS.EXP124. TQ666194. (satnav TN21 9LA) at the usual time of 10.00am. The walk notes state this is hilly, with a few stiles to cross. A picnic lunch is suggested with the optional drink at “The Swan Inn” at the culmination of the walk. Tim is to be your ‘Walk Leader’ for this stroll and you may contact him on: 01424~272459 or mobile: 07831~708588 for more details. Walk No: 2 is the first of the Annual Walk with the London Blind Walkers group and has been arranged for Saturday September 8th. and will consist of a six mile circular meander of around Westfield. The meeting point will be “The Moor”, Westfield. OS.EXP124. TQ813152. (satnav TN354 QR) again at 10.00am. The walk notes state that parking will be in the lay-by or along roadside by The Moor. Your ‘walk leader’ for this outing will be Jane and you may contact her on: 01424~ 733300 or mobile:07732~366090 for all further information. There is also a second walk with the London Blind Walkers group on this day - Saturday September 8th - of a slightly longer mileage but a slightly later start time. This walk will be a 10 mile circular country walk from Robertsbridge. The meeting place here will be at Robertsbridge Railway Station. OS.EXP124. TQ734235. (satnav TN32 5DD) at 10.30am. The walk notes state trains from Hastings 9.50am and from Warrior Square 9.53am arrives at Robertsbridge at 10.14am. Please check for engineering works and/or cancellations. Parking charges are in operation at Robertsbridge Station, but FREE parking is available at the car park at the top of Station Road (? Village Hall ?) and on the adjacent roadsides. As usual a picnic lunch is suggested. Your ‘walk leader’ for this excursion is to be Mary and you may contact her on: 01424~753730 or mobile;07785#926598 again for all further information. STAPLECROSS & EWHURST GREEN WOMEN’S INSTITUTE: Back after their ‘summer sojourn’ the merry members of this popular and friendly local W.I. will be making their way to the village hall in Northiam Road, Staplecross on Tuesday September 4th. The meeting will begin at 2.00pm and the guest speaker is a well known and well respected local resident - Brigadier Hugh Willing. Hugh has given several talks throughout our community, on a wide variety of subjects and these have always been met with high interest and this talk promises to be in the same vein. The title for this afternoon’s talk is “The Rye Lifeboat “Mary Stanford” Disaster”. This is a tragic, compelling true tale of heroic deeds and unstinting bravery. Accompanying this talk, as always, is our little fun and friendly ‘competition’ which always brings out the camaraderie of our little village W.I. New members will always be given a warm welcome and for more information of what we are and what we do, - please contact Ann on 01580~831944 who will gladly tell you what is on our Calendar of Events and what to look forward to for the remainder of 2018. DATES FOR YOUR DIARY: - Diary Date No: 1. - not that far away. The ‘menu’ of ‘Promises’ secured so far include the following: = A Handcrafted Garden Bench ; a Full Car Valet; a Valet for 2x Cars; a Family Photoshoot; Bags of Kindling; a Half-Day Pressure Wash; Air Balloon Rides; a Watercolour Painting of your Pet; a Children’s Pool Party; a Dinner for 6 People - Cooked at your Home; a River Cruiser Excursion on the River Rother; a Vineyard Tour & Wine Tasting Date; an Annual Booster Vaccination for a Cat or a Dog; a Limited Edition Print of Rock-a-Nore, Hastings; a Signed Book by Jimper Sutton and the Privilege of Lighting the 2018 ESBS Huge Bonfire- (under supervision & guidance, of course !) All of these plus more to come, I’m sure, will be on offer-up for grabs - & ‘sold’ to the highest bidder on what promises to be another fantastic event in the calendar of this wonderful local and hard working charity which does so much for our local community Please make a note of this date, come along and support this event, whilst having a great time amongst congenial company. You may even end up with a ‘Promise’ of a lifetime if you put your hand in your pocket, make a pledge and yours is the winning bid ! Now that will really show your support!. DIARY DATE NO: 3 - STAPLECROSS VILLAGE HALL - MAMMOTH JUMBLE SALE - For circumstances beyond our control, the Trustees of this much loved Village Hall were unable to hold their Spring Jumble Sale back in the spring. But fear not, good folk, - a Grand Jumble Sale is being planned and the date has been booked ! This will take place at the Staplecross Village Hall, Northiam Road, TN32 5QG on Saturday September 22nd with the doors opening at 2.00pm. Donations can be brought to the Village Hall from 9.30am on that day, but if you can’t wait until then, then please contact either Anne on 01580~831881 or Larry on 01580~830576 who will be happy to arrange collection from you. This could be the perfect time to ‘de-clutter’ -just in time for Christmas !! !.Teas & coffees will be available throughout the afternoon with a super cake stall and raffle stand for all to enjoy. Entrance is 20p..Don’t Miss It !. DIARY DATE No: 4 - MACMILLAN COFFEE MORNING - It’s that time of the year again, when the whole community come together to enjoy and support this “Coffee Morning - with a Difference” event. Up and down the country - and even across the world - people are getting together to enjoy a cuppa, a slice of cake and enjoy congenial company whilst helping to raise such necessary funds for this amazing good cause. The date to remember is Saturday September 29th. at Staplecross Village Hall between 10.00am and 12,Noon. There will also be a raffle stall and a Tombola for the lucky ones to try and perhaps other stalls to peruse. This date is not that far off, and perhaps you may find a suitable ‘gift’ to donate to the raffle stall. This is such a super little event, for such a worthwhile cause that this is definitely NOT a date to miss ! Please contact Pauline on 01580~830570 for all further details. PATRONAL DAY - ST. GILES’s DAY - This will be the second ‘Patronal Day’ for our parish, and St. Giles’s Day is the 1st September and this year this date falls on a Saturday - To mark this special occasion we will be welcoming the lay clerks of Canterbury Cathedral to sing Evensong in the beautiful historical little church of St. Giles church in Bodiam on this day beginning at 5.30pm. This will be an inspiring service and to help the celebrations of this special day, there will be drinks following the service with an invitation and hope that many residents of the parish will come along and share in this holy day celebration. CHURCH SERVICES: Church services for the parish of Ewhurst will be Church services for the parish of Ewhurst, will commence at St. James the Great, Ewhurst Green on Sunday September 2nd.Trinity 14. at 9.30am. This service will include Holy Communion. (CW) A Patronal Family Service at St. Giles church, Bodiam will follow directly after at 11.15 am. and this service will also include Holy Communion.. There will be NO SERVICE TODAY at St. Mark’s church, Northiam Road, Staplecross. If there is any church matter on which you feel you may need further assistance, especially Baptisms, Weddings and sadly, Funerals, then do please get in touch with the Priest - in - Charge, which is of course - Canon Christopher Irvine on 01580~830925. Help in some way is always at hand and always so generously given, so do please contact him. ANY NEWS FOR THIS COLUMN - PLEASE CONTACT ME: Although news of ‘events and happenings’ taking place throughout our community is rather sparse at present, this does not reflect on our life in general within our parish, With the schoolchildren on holiday from school & colleges, life may seem rather quiet at present. But fear not residents......events are being planned for our enjoyment I’m sure and very soon this column will be buzzing with news of them all.! So if you have an event planned in the foreseeable future - whatever the nature of the event - indoor or out, large or small and and you’d like some extra free coverage of it, - courtesy of the Observer Newspaper then please get in touch.- then please do get in touch. If it’s of interest to you --- then it’s of interest to us. It’s NEVER TOO EARLY to send in any of the information and details regarding the event you are planning - so please do contact me as I’d love to hear from you and to help ‘spread the word’ on your behalf......Thank You. .